Measurements: 2.8 x 4.32 inches; or 70 x 110 millimeters. Back of card: The Tree of Life with various colors of spheres & connecting lines, set against a collage background. Does not contrast well with the front. See other notes below. Book included: Yes, 236 pages, 6 x 9 inches, or 15 x 23 cm. B&W illustrations. Comments: A new deck. The major arkana cards in this deck are not numbered & are not quite standard. Suspension replaces Hanged Man, there are also cards called, Art, Aeon, & Destiny, not quite certain which cards these replaced. The Wheel of Fortune is called simply, Fortune. Court cards are the normal King, Queen, Knight & Page. The Navigators Tarot of the Mystic Sea is based on the traditional Golden Dawn foundation of the Hermetic Cabala. The glyph representing the Cabala , which is a system enabling us to understand our inner energies, is known as the Tree of Life. The illustration on the back of this deck displays this glyph, upon which are ten spheres, or sephiroth, of different colors. 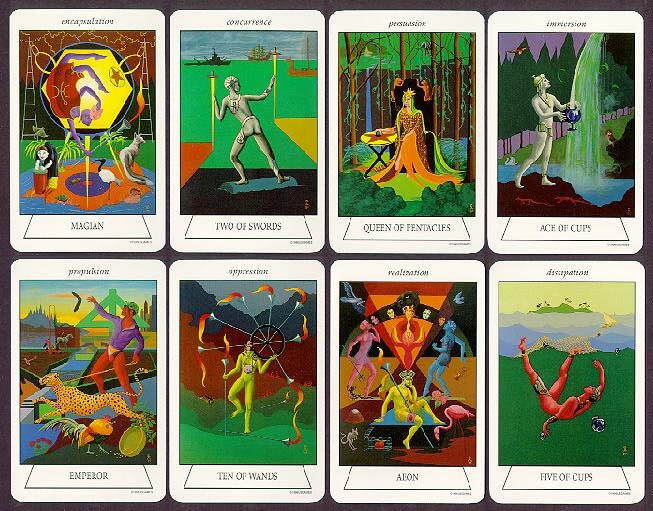 Between these spheres, which are centers of psychic activity, run the 22 paths of the Major Arkana cards of the Tarot. The 10 spheres & the 22 paths make up the total '32 Paths of Wisdom' by which a person may come to know themselves.